I’m so excited! I finally actually picked out a Duvet for both of my kids’ room makeovers. I hemmed and hawed for months until I found the perfect ones. Can’t wait to show you! But for now, let’s have a party, shall we?! 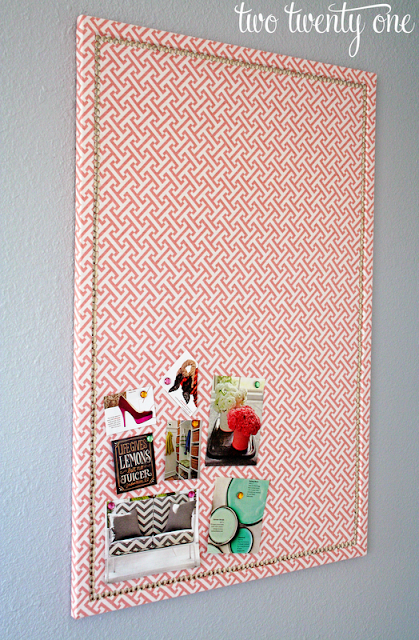 Two Twenty One made a beautiful fabric & nail head trimmed cork board. This is such a pretty canvas made by A Pumpkin & a Princess. The Space Between reused some ugly canvases to create these custom paintings of her dogs. They are so cute! Thrifty & Chic gives a great tutorial on how to make your own Puckered Duvet Cover. The Creative Imperative is so good at thrifty organizing. 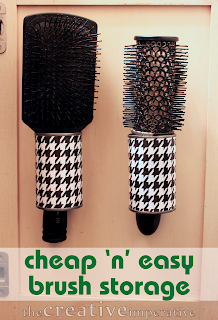 Check out her hair brush solution using cans. I really love the look and functionality of this Command Center by It All Started With Paint. Burlap & Denim hand painted the two Gasoline Signs on the wall. They are amazing! 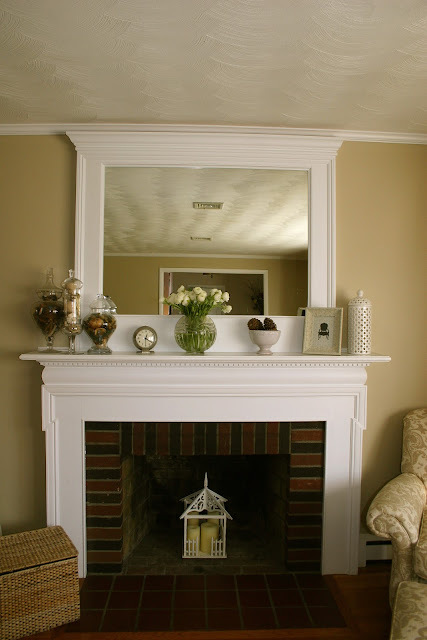 I’ve been considering building in a mirror over my fireplace but wasn’t sure how it would look. Thanks to No. 29 Design for doing it first, I now know I 100% want to do it! This looks like such a yummy and cute fruit bouquet. A Baker’s House shares how you can make them yourself. Laughter and Grace redid her dining room with wainscoting. It looks amazing. I especially love the trim around the window! Wow Allison!! Thanks so much for featuring my doggy silhouettes among these other great projects. Thrifty and Chic’s guest bedroom is so awesome, I need to check out that duvet tutorial. Hi Allison! Can’t wait to see the duvet you choose for your kids rooms! I just linked up…thanks for hosting!!! You have a wonderful blog! Please drop by my blog sometime and say hello! I LOVE visitors and comments!!! Looking forward to seeing your kids rooms! 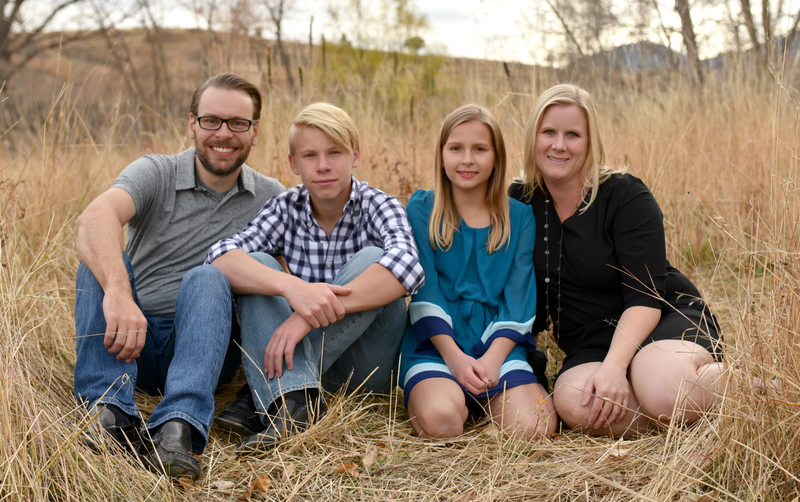 Linking up again tonight – thanks! I made it for my husband for Valentine’s day from a Pinterest inspiration and I love it! =) So easy! I love the projects you featured too….especially the duvet cover and the gasoline signs……oh, and the command center…….ok, all of them, haha! Thanks for a night-ful of things to go check out! Yea!! 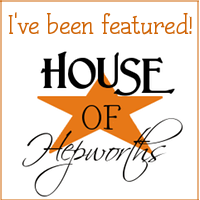 Thank you so much for featuring my dining room, Allison! I really appreciate it. I love your blog and have been following for quite some time now. Thanks for hosting a great link party every week! Awesome features!! Thanks for hosting! Thanks for hosting! Can’t wait to see the duvet covers! These are great features, Allison! Wonderful features, Allison! Thank you so much for including my cork board refashion! I hope I linked up in the right category. My project today is both a DIY and a recipe so….here’s an explanation, and if you need to move it-go for it! Thanks for hosting… i love the dog pictures you featured! awesome! Thank you so much for featuring my fireplace. I love coming to these parties and getting such great ideas from everyone! Love that fireplace mantle. Great feature! Thanks for hosting. Happy Thursday!! My goodness- what a wonderful surprise to see my fruit flower bouquet on your site! You made my day, thanks! I so enjoy your site and it’s an honor to be featured here. Thanks!! Hi there! Thank you for hosting. I love coming over to your blog! Thank you so very much for the feature! Your readers have been stopping and leaving such lovely comments … so greatly appreciated! Thank you so much for hosting. I hope you had a Happy Valentines Day! Thank you for hosting! I loved the feature on the dining room…think that may be in my future! Hey Allison…just a heads up that I sent you an email about a week ago…not sure if it got stuck in spam or you just haven’t gotten to it?? ?